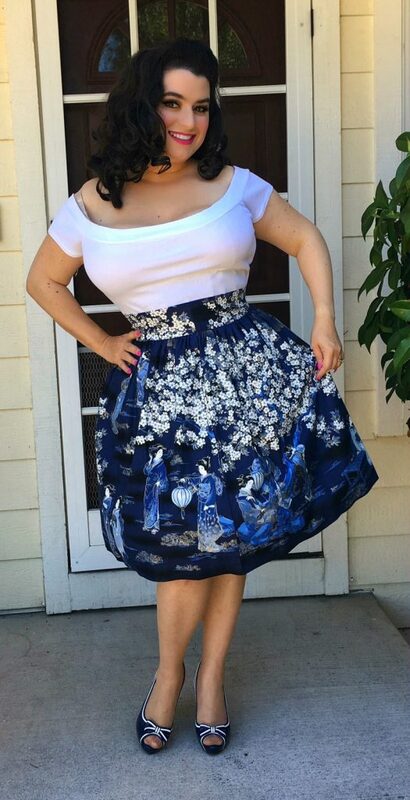 Pinup Girl style with Asian flair is done beautifully in this gorgeous Heart of Haute Gypsy skirt in the Geisha print. We snapped a couple pictures just before heading out for the afternoon and I am so happy I get to share the details of this lovely outfit with you all. Let’s begin with the stunning pattern on this skirt that depicts a lovely scene straight out of days-gone-by Japan. The Geisha print Gypsy skirt has colors of white, midnight blues, dark blues, and gold making it pop and of course the elegant Geisha are depicted in scenes of every day life with gardens and glorious cherry blossom trees and lanterns decorating the skirt. I received so many compliments in this outfit!! The skirt has a nice wide waistband and gives your figure a very curvy feminine shape and it came to just below my knee, has a center zipper and is 100% cotton. I am wearing the XL in this skirt and it fits spot on to the measurements. I paired the stunning Heart of Haute Gypsy skirt with the Heart of Haute white Marilyn Tee. The top is so soft (just like all Heart of Haute tops) and has perfect shape and structure with a good amount of stretch (I am wearing the top in a 1X to accommodate my bust) 100% cotton knit. This top is a wardrobe staple and comes in a variety of colors. You can wear the Marilyn Tee higher on your shoulders or off the shoulder depending on the mood or look you are going for and it can be worn dressed up or down. For my look today I wanted the skirt be the main focal point so I didn’t accessorize with any brooches or necklaces but did add some dark blue peep toe Pinup vintage style shoes. I am very much looking forward to adding many more Heart of Haute Gypsy skirts and tops to my wardrobe and no doubt need a much bigger closet!! Heart of Haute is such a quality brand and all items are made in the USA. Heart of Haute is a mother-daughter duo of Teresa and Mandie Becker. You can find dresses, skirts, tops, sweaters and accessories at this fabulous shop. Customer service is dynamite and your orders are shipped quickly and packaged with great care. Heart of Haute regularly has new items (dresses, skirts, tops, accessories) that will surely have you lusting for their latest collections and you can be confident knowing you’ll look like a gorgeous bombshell every time! !